CBL cement bond logging tool include: the cement bond logging CBL, VDL, CCL, GR, NGR (neutron-gamma) , which can measure and record : variable density, acoustic amplitude, magnetic orientation, natural gamma, neutron-gamma Ma-etc. ,total five kinds curves, to check the quality of well cementation and find other leak problems. CBL series 's diameter are Φ43, Φ51, Φ60, Φ73, Φ89, etc., and the outer diameter of Φ43 and Φ51 's CBL cement bond logging tool is more suitable for windows, sidetrack or horizontal wells. The meter can be a single or multi-core transmission, it can be AC or DC power supply. ● neutron - gamma source distance: 60cm. Casing collar locator CCL include : wound coil which is winding on a soft iron core and 2 permanent magnets. when it passed casing collar, it will have approximately 1Hz frequency signal in the coil's 2 ends , after the treatment of the electic circuit , it will be added to the single-core cable ,then it will be sent to the ground system, with a certain treatment and be recorded , working with the CBL logging, providing accurate depth. cementing quality of second cemented surface - cementation situation of cement and formation . Cement bond logging tool can measure 4 curves: CCL curve, GR curves, acoustic amplitude curves and variable density curves. The basic principle is as below :the cement and mud 's acoustical impedance have a big difference , it fluence attenuation of sound waves when transmitting along the tube axis , so to Reflect the Cementation quality of the cement and casing . the cement bond logging tool have an acoustic transmitter and a receiver ,the transmitter and receiver have a distance . When the acoustic transmitter emitted sound waves , the receiver receives sigals,the signals include : casing wave ,formation wave , mud wave. For cased well, when well casing ,the outside(Peripheral) is cement; if is not well casing , the outside(Peripheral) is mud , or part is mud/slurry . Since the acoustic impedance of mud have a big difference with casing , so the first wave amplitude of casing is closely realted with cementation Quality. In the acoustic amplitude logging, the non-cemented casing section is called free casing; if with Cement consolidation,Casing wave amplitude will be Obviously decreased. Therefore, the amplitude(range) of casing wave attenuation or attenuation measurements ,it could show the Cementation condition of cement and casing ,and indicating a high cement returns. Most people are interested in variable density logging ,because it reflects the second cemented surface, that is cementing condition of cement and formation . 1. For freed casing: casing wave amplitude is big , wave formation is weak. 2. For the casing and cement, cement and formation are cemented with good situation: casing wave amplitude is small, the formation wave is big. 3. 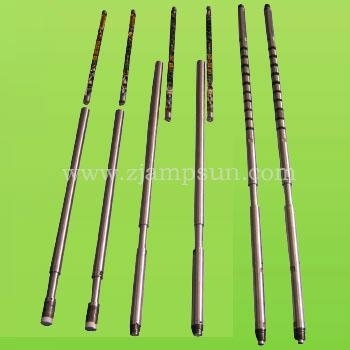 For casing and cement consolidation is with well condition, cement and formation is unconsolidated : casing wave's amplitude is small, the formation wave 'samplitude is s,some times you can not find/discover formation wave. Thus, the wave formation strength of the receiving signal is a measurement of the quality of the second cemented surface. see the Whole Well, casing wave's arrival time is basically stable and unchanging, But due to difference of formation instrument that encountered , the formation wave 's arrival time will Obviously change .This feature of casing wave and formation wave is providing two good constions when Variable density logging to identify and distinguish the two waves. Natural gamma logging is to measure formation 's natural radioactivity. formation 's natural radioactivity is caused by the Uranium, thorium, potassium and other radionuclides of the rock .aggregation of these Radionuclide in the formation is related with Depositional environment of formation .Therefore, the measurement of natural radioactivity can learn something about the formation geological questions. Whether casing wellor openhole well ,both could use Natural gamma well logging . Natural gamma logging tool can be combined with any other logging tools to downhole . Therefore, another important use of natural gamma logging is for stratigraphic correlation. In the cement bond logging, the main purpose of natural gamma logging tool is to regulate the depth . CCL logging is used to determine the location of casing collar.